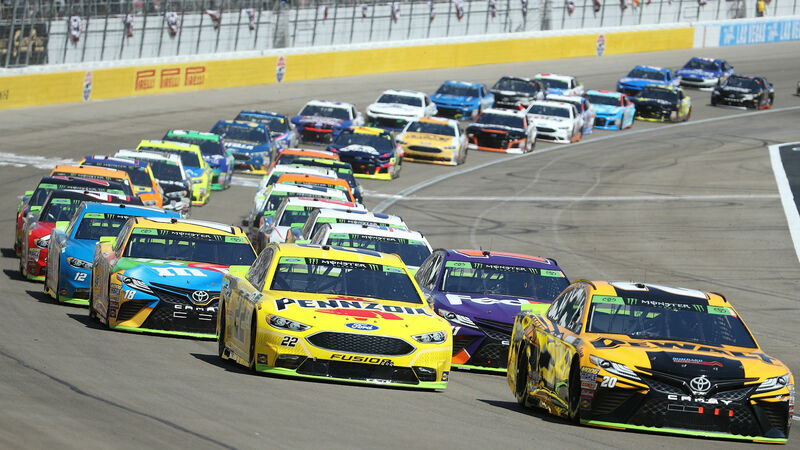 As NASCAR Cup Series championship contenders dropped one by one Saturday in Las Vegas, Brad Keselowski averted disaster, made efficient pit stops and drove his way to a third consecutive victory. Keselowski’s playoff-opening triumph clinched advancement to the next postseason round. Others, such as point leaders Kyle Busch and Kevin Harvick, weren’t as lucky. Busch skidded through the grass and finished seventh, while Harvick hit the wall and was knocked out of the race in Stage 2. Playoff contenders Denny Hamlin, Chase Elliott and Eric Jones were also sidetracked by serious crashes. Kyle Larson and Martin Truex Jr. finished behind Keselowski to round out the top three in Las Vegas. 7:02 p.m. — Larson finished second. Truex Jr. finished third. What a wild race. 7:02 p.m. — Keselowski does it! Third straight win! 7:01 p.m. — Keselowski is way in front! One lap to go. 7 p.m..: They’re back at it! 6:59 p.m.: Keep in mind that no one is on fresh tires. That could be an issue here during overtime. 6:55 p.m.: Yellow flag. We’re almost ready for what should be a crazy finish. 6:50 p.m.: Here’s how things stand as we wait out this delay. 6:43 p.m. — Keselowski is ahead but there’s another HUGE crash! Kurt Busch was involved. Red flag. 6:41 p.m. — It’s a two lap showdown here. 6:37 p.m. — Another caution. Wow. Restart order for a green-white-checkered (but not official overtime): Keselowski-Blaney-Logano-Larson-Truex-Newman-Suarez-Dillon-Almirola-Menard-KyBusch. Those are the top 11. 6:37 p.m. — Seven to go. Keselowski back on top. 6:35 p.m. — More issues for playoff contenders. Both Jimmie Johnson and Alex Bowman have tire issues. 6:34 p.m. — Larson speeds back into the lead! Ten to go! 6:29 p.m. — Keselowski is now ahead, trailed by Logano and Larson. Restart order: Keselowski-Logano-Larson-Truex-Blaney-Johnson-KuBusch. Bowman-Almirola-Bowyer are 10-11-12. Dillon is P14. Kyle Busch is now up to P20. There will be 11 laps to go this time. 6:26 p.m. — Another caution with a crash in the back. Remember how clean Stage 1 was? We’re a long way from that. 6:25 p.m. — Positions out of a restart. 6:21 p.m. — Larson is hanging on with 20 laps to go. Could be a crazy ending here. All the leaders are down to scuffed tires, so they stay out! 6:20 p.m. — Denny Hamlin in the grass! Holy cow. Another contender is done. 6:19 p.m. — This could not be closer. Larson is using a high position as Keselowski tries to pass him down low. 6:17 p.m. — Keselowski and Larson are side by side. Twenty-six laps to go. 6:16 p.m. — Larson speeds into first! Wow what a move there. 6:14 p.m. — Thirty laps to go. Keselowski, Truex Jr. and Larson lead the way. 6:12 p.m. — Here’s video of that Kyle Busch incident. Kyle Busch goes nose first through the grass, and DOESN’T tear it up. 6:08 p.m. — Kyle Busch drives into the grass! He’s trying to continue but that was bad. Amazing job to keep it off the wall. This race is unbelievable. How can anyone predict this stuff? 6:07 p.m. — Aaaaaand it just might not be Dillon’s afternoon. Yikes. Austin Dillon (P10) says he has a “weird chatter” in the right front and is concerned. 6:06 p.m. — Austin Dillon is in 10th! Despite a frustrating day, he could finish in a decent position. 6:02 p.m. — Jimmie Johnson is down to ninth with 45 laps to go, but according to NBCSN, his crew is confident in his car. Can he make another run? 5:57 p.m. — Pit road has been big today. Martin Truex Jr. loses the lead on pit road and falls to third place. Penske teammates Keselowski and Logano will restart 1-2. 5:56 p.m. — Fifty more laps! 5:52 p.m. — It seems like Elliott is shaken up after that crash. A big hit for Jamie McMurray and Chase Elliott. They’re done for the day. 5:50 p.m. — Big crash involving Chase Elliott. The hood of his car is almost torn off and he’s done. Chase Elliott drops the window net and that means his race is over. He will finish somewhere around 37th. 5:47 p.m. — Fifty-five laps to go, and Truex Jr. is starting to pull away from Keselowski. NEW LEADER: @MartinTruex_Jr takes the patient approach and makes the pass on @joeylogano. 5:43 p.m. — Can Keselowski pull off a third straight win? It might come down to the wire. Martin Truex Jr. threatened to pass Brad Keselowski for the lead for about five straight laps and finally cleared him with 65 laps to go at Vegas. 5:41 p.m. — Harvick complained about his tires after he crashed out of this race. Goodyear has a response. 5:38 p.m. — Lots of movement at the front right now. 5:36 p.m. — With 77 laps to go, here’s your top five: Keselowski, Logano, Truex Jr., Larson, Ryan Blaney. 5:30 p.m. — Caution for the rookie. 5:25 p.m. — Keselowski is back in the lead! Kyle Larson is in second. 5:22 p.m. — Keselowski replaced his tires and is now back up to second place. 5:14 p.m. — Crushing blow for Bowman, who had been solid throughout the afternoon. 5:10 p.m. — We’re through Stage 2. Keselowski is still in first. 5:09 p.m. — Jimmie Johnson! He’s fighting for third with a huge surge. 5:07 p.m. — Five laps to go in Stage 2. Keselowski in the lead. 5 p.m. — Here are some visuals on that incident. 4:58 p.m. — The drivers, understandably, are upset with that. 4:56 p.m. — Huge moment here, folks. Playoff drivers Kevin Harvick and Erik Jones make contact and both have heavy damage and are done for the day. 4:51 p.m. — Aric Almirola is the lowest-ranked playoff driver right now. He’s in 19th place. 4:50 p.m. — Halfway through this one! 4:44 p.m. — Truex Jr. is in the lead with 33 laps remaining in Stage 2. He’s probably been the most consistent driver today. 4:42 p.m. — It’s the little things that add up. 4:37 p.m. — With 45 laps to go in Stage 2, Kyle Busch had to go back down pit road.
. @KyleBusch had to bring his car back to pit road to secure additional lug nuts on that last stop. 4:33 p.m. — Another caution amid a chaotic Stage 2. 4:31 p.m. — Dillon, working without his normal crew chief, continues to endure a frustrating afternoon. 4:25 p.m. — It’s been a quiet day for Jimmie Johnson, but he’s cracked the top-10 with 60 laps to go in Stage 2.